'Hidden' - A work in progress. Just a quick note to show you what I have been up to. The first is this piece I have been working on as a bit of an experiment. I might turn into something I can use, I am happy with it so far. 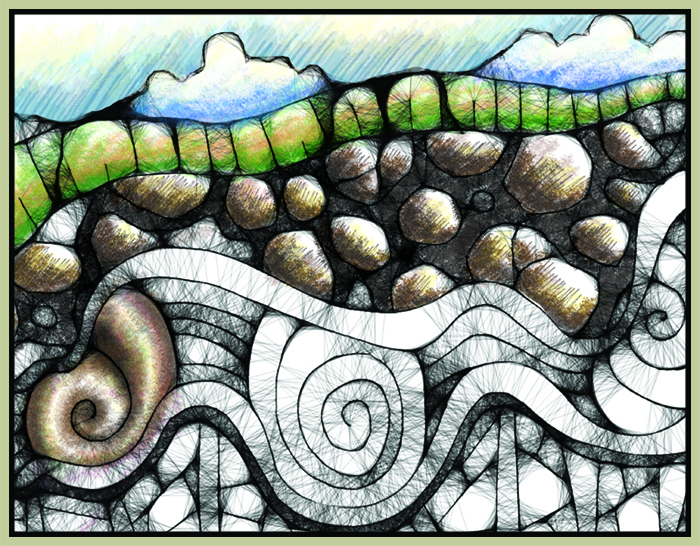 It was drawn freehand in 'Scribbler Too', and then coloured in Photoshop. As you can see it is a work in progress. I used a few of my 'Dangerous Doodle' Tutorial designs in this one. Can you find them? Henna update: the colour darkens. The second update is to show you another sort of 'work in progress' - my henna hand that I decorated last night. I forgot that it actually goes darker after a day or so, which is a nice surprise! It was a sort of orangey-yellow last night when I washed off the henna paste. Now it has turned a lovely earthy brown colour. Apparently you can put a mixture of lemon juice and sugar on the henna paste after you have finished the design, and this will make it go even darker. I will have to try that next time. Henna...The Ultimate in Doodling Fun! I thought I would make it a special Eid tradition for us. 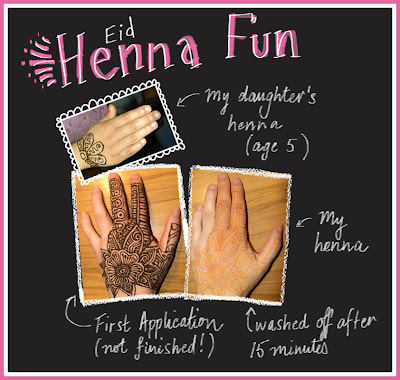 Muslims are not permitted to tattoo themselves permanently, therefore henna is a great halal (permissable) way for us to decorate our body on special occasions...and the good thing about it is that if it looks awful, it won't last forever (not like permanent tattoos). 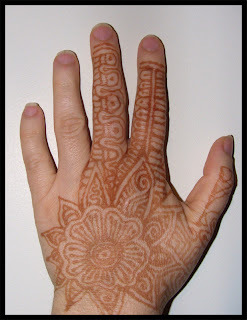 The first time I ever had henna on my hands is when I visited Morocco to meet my husband's family. My husband's sister patiently applied the decorations to my hands at night, and then in the morning we travelled to Fes to see the old medieval Medinah and get lost in all the ancient winding alleyways...oh those were the days...travelling is so much fun! As you can see in the photos, I had to wash off my henna after about 15 minutes, and I didn't get to finish it properly...someone needed feeding, and it's a bit difficult to feed a baby with gooey green stuff all over your hands. But it was fun to experiment, and I might go back later and reapply some of the lines to accentuate them and make them darker. If you're a keen doodler, you just have to try this, it is so addictive! 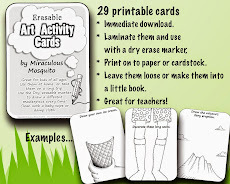 You can practice on a bit of paper first if you are worried about staining your hands. To get nice fine lines, you can use a plastic syringe if you can get one, just make sure you get one with a blunt needle (and make sure you're in a quiet area and not in danger of being 'bumped'), and make sure your henna is very finely sieved. I'm definately going to do more of this...I'm hooked! Expect more henna experiment photos soon. Next time I might even try to do a video as well. 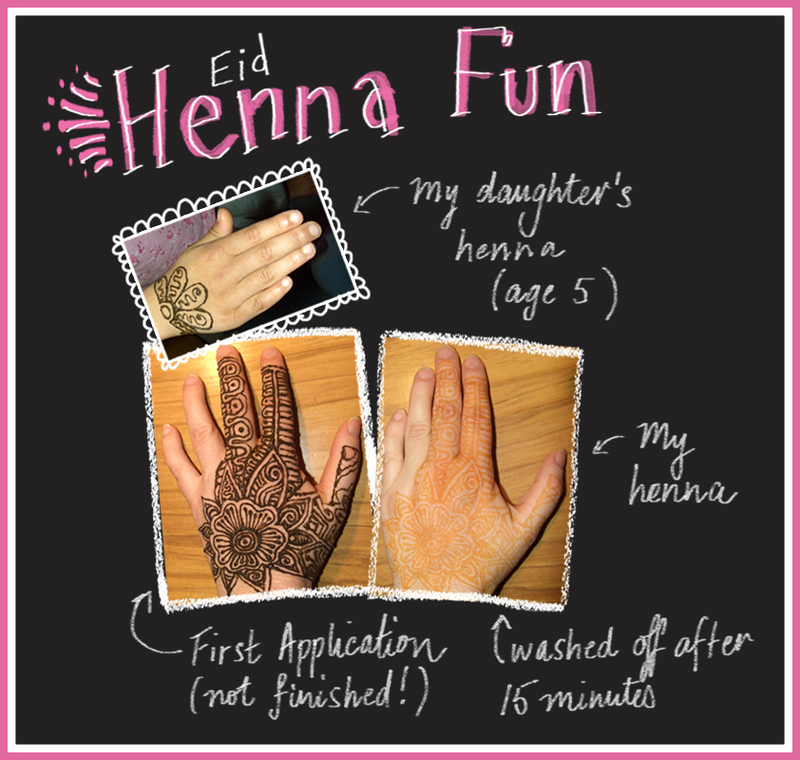 Important: Make sure the henna you use is safe for use on your skin. Avoid BLACK HENNA, which can be dangerous and has harmful chemicals mixed with it. Check out Henna Bee's fact page for more information. Links to this post Labels: drawing. The Latest Dangerous Doodle - 'Shell Treasures'. There is so much inspiration in the natural world around us, the possibilities are endless. I love stopping to look at all the small details in natural objects. Children also remind you that you should take the time to look at these things and appreciate them. I have three small children, they are aged 5, 3 and 6 months, and they never get tired of talking about things like how a snail is different to a snake, and how all the animals have their own special abilities. Just today I found myself explaining to my 3 year old son how a snail can stick really well to objects and has these wonderful things called antennae sticking out of its head, whereas a snake is shiny and has scales and can hurt you. We then spent some time watching some great videos on YouTube about snails and snakes and discussing the difference. 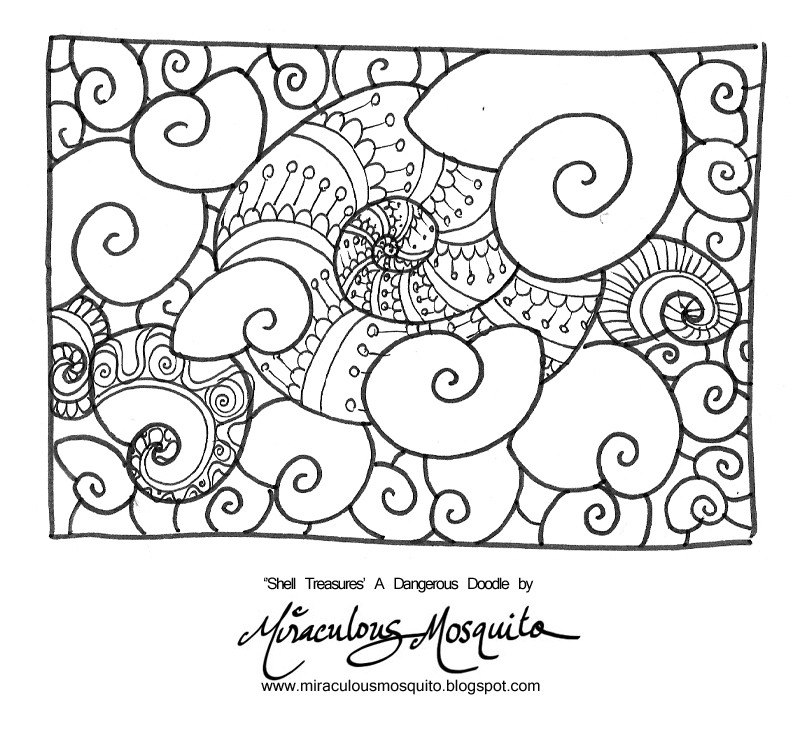 On that note, here is the latest 'Dangerous Doodle' Tutorial, which celebrates another natural object, the sea shell. Not just exquisitely beautiful, but totally practical as well...and when the original animal has finished with it, it becomes a home for someone else who needs it. How's that for recycling! Isn't is amazing how natural objects are designed perfectly to fit in nicely within our environment, whereas it is usually the objects designed by humans (usually the ones that we think are so clever) that tend to cause so many problems. If only we could learn to appreciate the world that has been provided for us and not try to change or 'improve' it, perhaps we would be a lot happier. Anyway, that is my deep thought for the day...now let's draw! 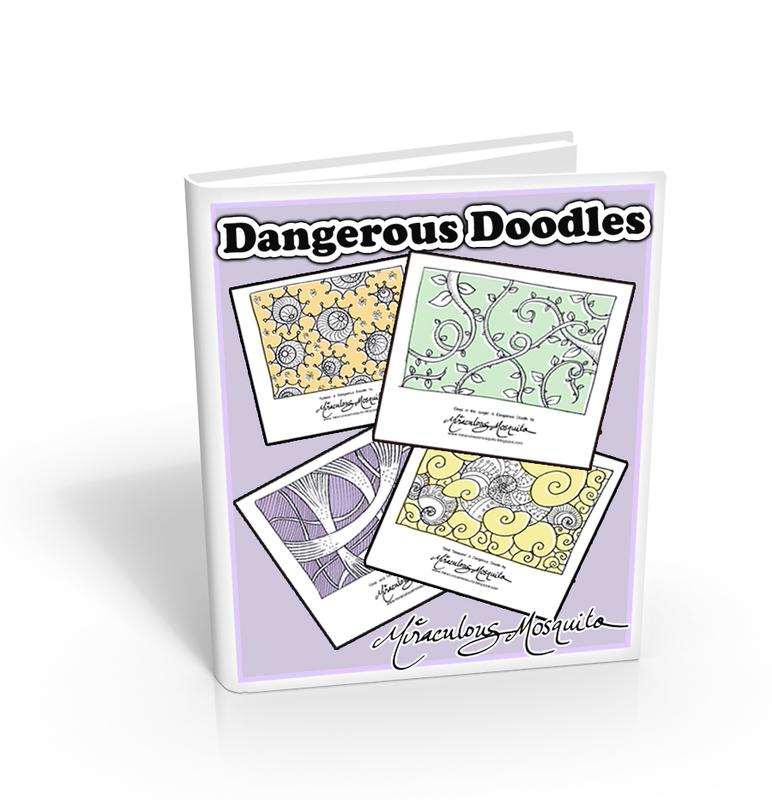 Oh, and don't forget to join the Dangerous Doodles Group on Flickr. 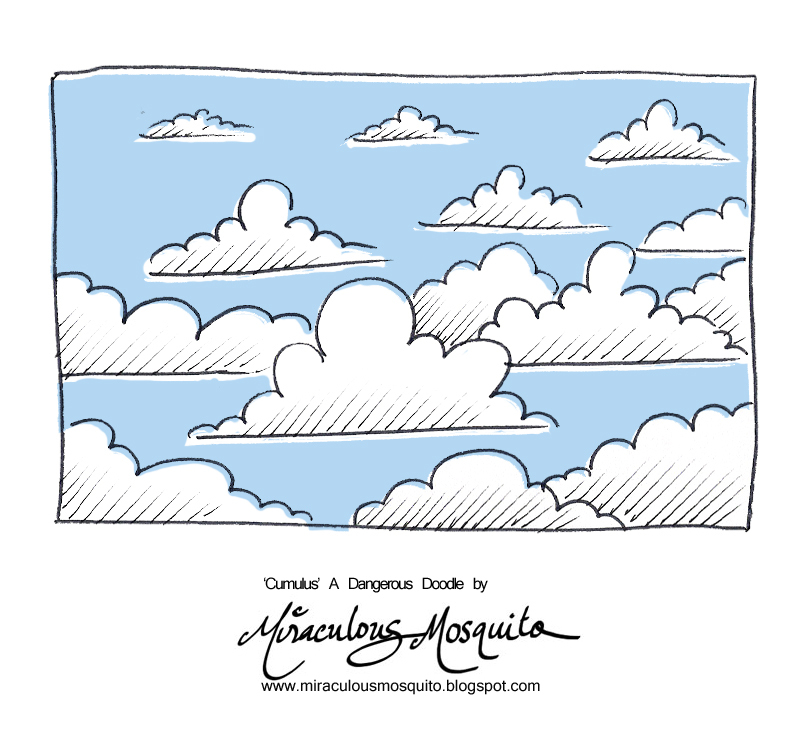 The Dangerous Doodles Flickr Group now has 24 members...YAY! Many of the members are very talented doodlers, so I really appreciate the fact that they have chosen to join our little group. 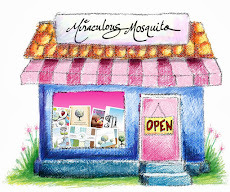 If you are interested in joining, you can find out more about the group in this previous blog post, or just click on the pink logo to the left which will take you straight to the group. There have already been some good suggestions on the discussion board, such as having some doodle challenges. So here is the first one for you to enjoy. I recently found this great video called 'The Art of Breakfast' made by Danny Gregory. Take a look at the video, it really made me feel like breaking out my inks and watercolours! The Art of Breakfast from DannyGregory on Vimeo. Breakfast...what a great theme for our first challenge! Interpret it any way you will, and come up with a doodle or artwork, created by yourself, which somehow relates to the theme of 'BREAKFAST'. Somewhere in your work should be one or more of the DANGEROUS DOODLE DESIGNS featured in the tutorials. There are 4 designs to choose from at the moment , and I will be adding many more very soon. Oh, and you don't have to draw the designs exactly as I did, please use your imagination and adapt them to your own liking. Don't forget to link to the Dangerous Doodle Tutorial/s you used, in your description, and write 'Dangerous Doodle Challenge #1' somewhere in your title. There is no time limit (there are too many time limits about these days, who needs another one?) just take your time and add your masterpieces to the group if and when you feel like it. I can't wait to see what you come up with! I hope that all makes sense! Feel free to ask questions if you have any. 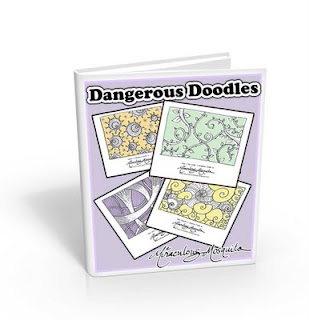 A 'Dangerous Doodles' Pattern Book? Suggestions Welcome. 'Dangerous Doodle' book cover could look like. Some of my readers have suggested that a 'Dangerous Doodle' book might be a good idea. I would like to have a go at making one, so I thought I would ask you for your input. What do you think? Should it be just a book of patterns, or include step by step tutorials as well? 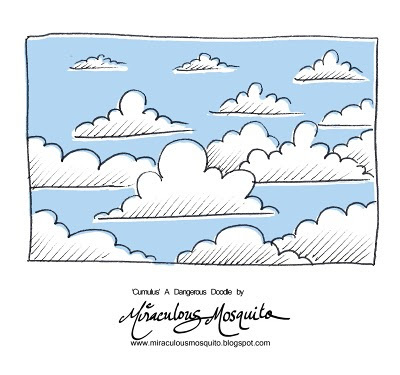 How much would you be prepared to pay for a book full of dangerous doodles? Would you like to see examples of other people's artwork inspired by the dangerous doodle tutorials? 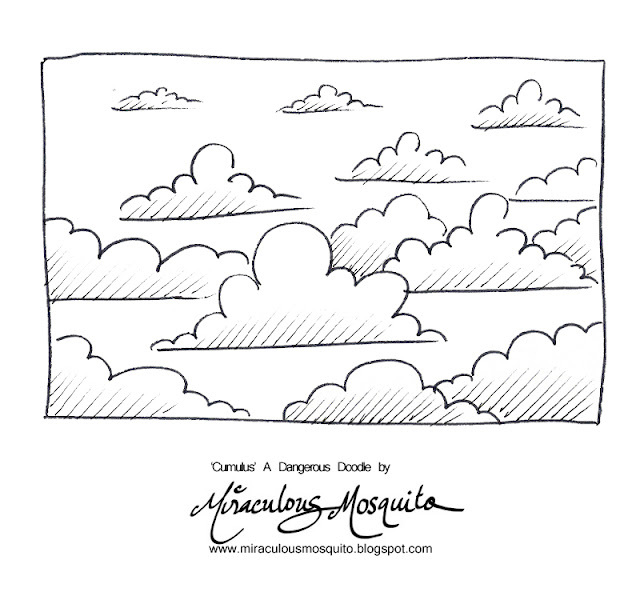 What else would you like to see included in the Dangerous Doodle book? Please join the discussion in the comments below if you are interested in this idea. Thanks for all the encouraging comments about my new 'Dangerous Doodle' Pattern Tutorials. I am feeling very inspired about these, and have already recorded many new doodle videos which are waiting in line to be edited (including the new shell design you can see in the picture above). Don't forget to subscribe to my blog if you haven't already, so you don't miss any new ones. The good news is, I have created a Flickr group named 'Dangerous Doodles' where you can share any artwork that you have made with these tutorials as the inspiration. You are welcome to join and post your masterpieces! They can be made out of any material, or be in any shape or form, as long as they are clearly inspired by the Dangerous Doodle tutorial series in some way. Just include a link to the particular tutorial/s that you used, in the description of the photo/picture. I have always loved this style of drawing, and I am so happy to see that there are others out there who also enjoy it. I think it really began for me as a serious addiction during maths class in high school...was it the same for you? Where did you first discover you had an uncontrollable urge to doodle? By the way, in case you were wondering, I never did too well in maths class. Art class, however, well that is a totally different story! The Art room was my favourite place...I think I even used to eat my lunch in there! Don't forget to tell all your mates about 'Dangerous Doodles' the new Flickr group! 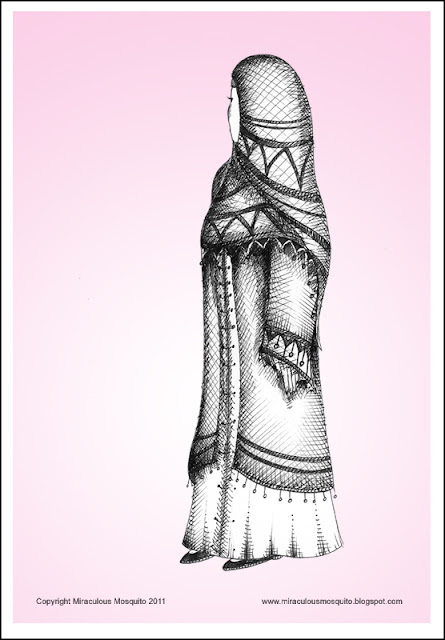 Eid Muslimah - Ink Drawing. Recently I came across a fun blog called 'What I Wore Today'. People contribute sketches showing...you guessed it...what they wore that day. I enjoyed looking at the different styles of drawing, there are some really original ideas posted there. It got me thinking...I would like to send in a drawing too. So instead of drawing what I wore that day in all my comfortable glory, I decided to wait until a much more special day before I posted my drawing. What would be so special about it, you may ask? It is the end of the month of Ramadan. The special day is called 'Eidel Fitr', or 'Eid' for short. 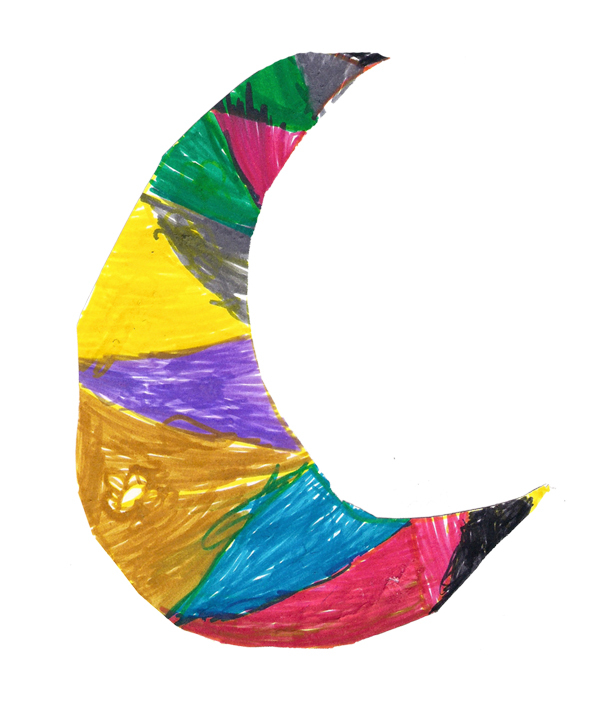 Just before Eid, Wellington Muslims venture outside into the cold winter air to sight the new moon, hoping for a clear sky as the sun appears to lower itself down behind the mountains. If Allah wills it, one of us might say 'I can see it' and point to the thinnest, curved sliver of light in the sky. It is a really magical event, and one which I enjoy more each time I witness it. I have witnessed it eight times since I converted to Islam 8 years ago, thanks to Allah. If the new moon is sighted, then the month of Ramadhan is officially over for another year, we finish fasting, and the next day will be the Islamic celebration of Eidel Fitr. Looking for the new moon is something new and interesting to me, because it reminds me that events in this world happen when our Creator wills them to happen, not us. This is something I never really thought about before I became a Muslim. I thought that everything in my life was pretty much controlled by me. For Muslims on Eid day (or any day for that matter) it shouldn't really matter how fancy your clothes are , or how fashionable you look, or which of the latest brands you are wearing. What matters is that your heart is as pure as it can be before Allah. During Ramadan, Muslims try their best to polish their heart by fasting, praying, giving charity, and doing good deeds for the sake of Allah. So I am happy if what I am wearing is the total opposite of what is in the fashion junk mail catalogs which clog up my mailbox every week. I don't care if what I am wearing is seen as 'old fashioned' to some people. My hijab (Islamic clothes) free me from so many of the superficial things we have to worry about these days, giving me the freedom to concentrate on the pureness of my heart. Actually, to be perfectly accurate, this wasn't exactly what I wore on Eid day, and the Muslimah (MuslimWoman) doesn't look exactly like me. The general outfit is the same, however I did get a bit carried away drawing the decorative bits. Let's say this is what I would have liked to wear :) . Also, Eid 'day' was a few days ago, but here in Wellington the Muslim community continues Eid for at least a couple of weeks, so that we all have time to visit each other. Assalamu Alaikum (Peace be upon you) and Ramadan Kareem!